BEYOND Max5 and Max10 In-Office Whitening Kits BEYOND Dental & Health BEYOND Max5 and Max10 produce optimal whitening with less sensitivity at a reduced cost. 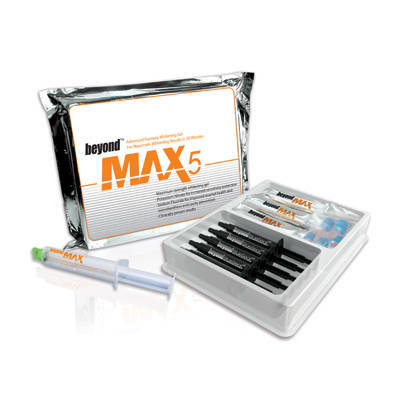 BEYOND Dental introduces the Max5 and Max10 in-offi ce power whitening kits. Designed for comfort, safety, convenience, and optimal results, the 30-minute treatment features a 35% hydrogen peroxide whitening gel made with a broad-light activation spectrum for use with any bleaching light.